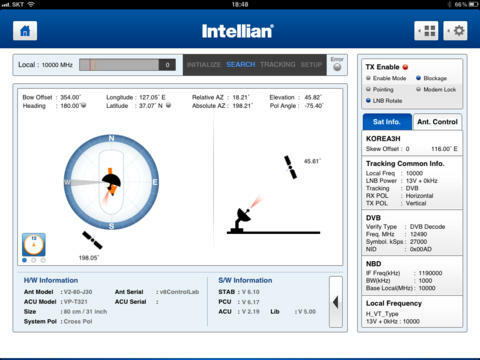 Almost all functions of Intellian antennas can be monitored and controlled from the Antenna Control Unit (ACU) front panel or remotely via a PC or smartphone if you wish. Some other manufacturers have moved away from the front panel control, which could be a limitation if IT complications prevent web access to the antenna. With Intellian, you always have the confidence of being able to access the antenna from the front panel to make changes, or to monitor the status of the antenna. The front panel shows real time data, rather than a web browser interpretation, which may or may not be showing outdated information. In addition to the front panel control, the antenna can be monitored and controlled remotely, via the Aptus web internal web page from any web enabled device, or via Aptus PC software, or from a iPad, iPhone or smartphone. Aptus Web and Aptus PC offer remote control from a PC, iPad, iPhone or smartphone from anywhere on the ship's network and even remotely from shore with a public IP address assigned to the ACU. AptusWeb is an internal web page within the ACU which can be accessed from any browser on the network just by typing in the ACU IP address. AptusPC or the smartphone Aptus apps provide more indepth, diagnosis tools and very cool graphical interface. The software or app is installed on the PC or device and then directed to either a serial comm port, USB port, IP address, or even the ACUs built in ad hoc wifi antenna access. There are several methods for accessing the ACU from a remote terminal. With AptusWEB and AptusPC the most common way is via the ship's network on the IP address assigned to the ethernet port at the back of the ACU, or via the ethernet port behind the door on the front panel, which assigns your PC an IP address or via the little wifi antenna on the back of the ACU. Aptus PC can use any of the above connections as well as the USB, 9 pin, and serial comm ports on the front and rear of the ACU. Intellian antennas work really well with or without ship's gyro input. Without the heading source, the antenna moves to the expected target elevation and then rotates in azimuth until it finds the satellite. If it does not, it will continue searching, in half degree steps both above and below the target elevation until it has searched the whole sky up 3 degrees above or below the target. Because of the advanced DVB-S2 tuner, or the external modem lock, to positively identify the correct satellite, the antenna moves quickly in azimuth and finds the satelite within a minute or two at most. If available, a proper Gyro input is still preferable as the antenna then goes directly to the satellite without having to do a sky search. The TV systems come with an optional WorldviewTM LNB which can be switched from linear to circular, and to any LNB local oscilator frequency eliminating the need to change LNBs when moving from one region to another. The VSAT systems come with an Intellian PLL LNB that can be programed to emulate any Local oscillator frequency suitable for any Ku-band VSAT network in the world. The antenna control unit is basically an interface between the the operators, the ship and the antenna. Most of the intelligence and process is housed in the antenna's main control unit. The antenna also contains he DVB-S2 tuner and narrow band tuner so tracking operations as well as stabilization are conducted within the antenna. The DVB-S2 tuner can positively identify modern digital TV satellites which greatly enhances the satellite targeting. A narrow band tuner is included for tracking of smaller bandwidth comms signals. All antennas can operate without a gyro compass input. Smaller VSAT antennas power the BUC from the ACU over the transmit coax. The tuner is located in the antenna, not in the ACU. 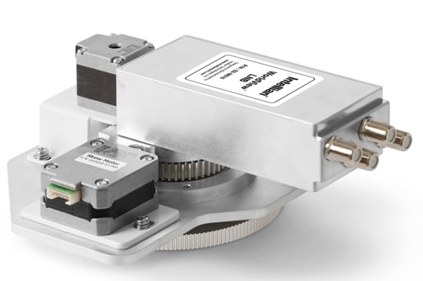 Worldview LNB switches between circular/linear/ and any local oscillator frequency. It has a DVB tuner with S2 capability and a narrow band tuner. The mounting pattern is a standard 9.74". 35570 visits to this page since 28 Nov 2012.